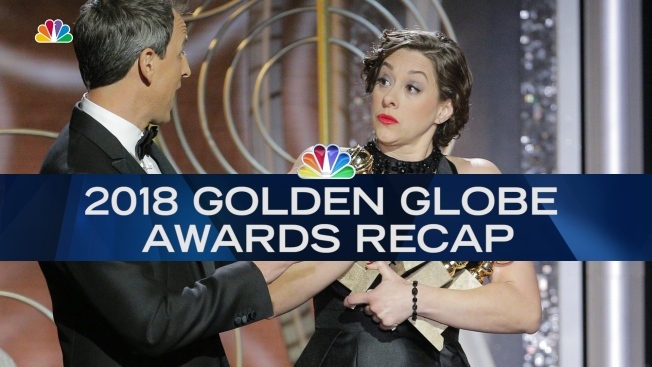 Golden Globes guests get to party after the ceremony ends, no matter if they win or lose. Eric Deggans, of NPR, tweeted "at HBO's Golden Globes party. Believe I just saw Milo Ventimiglia from This is Us slip and fall into the pool, which is mostly covered but open in one spot..."
Ventimiglia himself confirmed the faux pas later in a story on his Instagram feed. Sporting a wet head and glasses, he says it was a "good time at the Globes tonight," congratulated his co-star Sterling K. Brown on his win and says he's back home studying his script for tomorrow. He finishes by adding "and yes, I fell in the pool." Millie Bobby Brown, who plays Eleven on the Netflix hit series "Stranger Things," says she brought Drake as her "plus one" to the Netflix after-party. She posted on Instagram "blessed to have my security be my +1 at the Netflix party." The 13-year-old first met the rapper at a concert in Brisbane, Australia, in November. She posted a photo to her Instagram page afterward of the two of them smiling . Drake posted one of his of the pair making Eleven's powerful hand gesture from "Stranger Things." At the party, Drake was later seen taking over the DJ booth for a bit, chatting with Aziz Ansari and hitting the dance floor. Figure skater Tonya Harding and filmmaker Tommy Wiseau hit some after-parties, where they had at least one celebrity star-struck. Sebastian Stan, who plays the part of Harding's ex-husband in the film "I, Tonya," took a photo of the duo. People.com says he shared his photo on an Instagram story that he captioned "Happy 2018!" Allison Janney won best supporting actress for her portrayal of Harding's mother in "I, Tonya." She profusely thanked Harding, who choked back tears in the audience. James Franco won best actor in a comedy or musical for his portrayal of Wiseau, the mysterious man who created what many consider the worst movie ever made. Franco directed and starred in "The Disaster Artist." Model Miranda Kerr took the high-profile opportunity to debut her baby belly on the red carpet of the InStyle party at the Beverly Hilton. In November, Kerr confirmed that she and Snapchat co-founder husband Evan Spiegel were expecting their first child together. The two got married in May at their home in Brentwood, California.